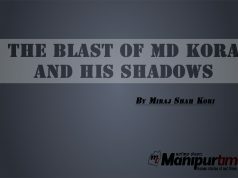 During the past 3 months of UNC (United Naga Council) stranglehold, the seized people in Manipur have tried all possible means to loosen the noose by coaxing, threatening, questioning, requesting and negotiating the UNC. All valley CSOs, the governments and political parties went berserk but only to find themselves at the feet of a frowning UNC. The highway blockade continues as the talks fail and the next talk slated for March 25, 2017 holds no promise yet. As all means exhausted, the suffering people go to bed everyday wishing the mighty UNC shows a miracle compassion when they wake up the next morning. 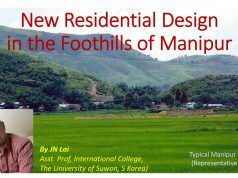 The basic premise for UNC objections to the new district creation in the state is that it somehow affects the land rights of the Nagas. 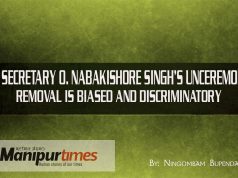 UNC claims that under certain constitutional provisions of India, Nagas have exclusive right to the land they inhabit and the government cannot do anything to it without their consent. Opposed to it is the interpretation of Chief Minister Ibobi that says – land belongs to government and the government has authority to administer it. Who is right here and who will decide? Is the same right UNC is claiming applicable to other tribes in the state? If so, why are other tribes silent about the new districts in their areas? Do we have expertise and authority to debate constitutional provisions and law to provide authoritative answers to these questions at the tripartite talk? The next question is whether the state government have the authority to pass executive orders for district creation in tribal areas without consulting the Hill Areas Committee of the State Assembly under Article 371C? UNC says these executive orders are not valid without HAC endorsement while state government maintains that it has nothing to do with HAC. Can the adversaries decide by themselves at the negotiation table without a say by legal experts in this regard? Can we settle constitutional and legal matters at the negotiation table? Negotiation is a conflict management method that relies on settlements through compromise, that means an understanding for give and take. Can we compromise constitutional provisions and their interpretations at a negotiation table before an amendment is sought? If not, why are we wasting our time holding talks with UNC when its demands attract constitutional debate and its protest method declared illegal by a few courts in the country? Shouldn’t we seek remedies through constitutional and legal debates and enforce compliance of what is decided in the court? Though political tactics of creating the 7 new districts at the fag end of the term of Ibobi government cannot be ruled out, the decision was not purely irrational for the government since all these districts had already been demanded by the inhabitants and the people in all the new districts welcomed the government’s decision. As such, rolling back the district creation orders by yielding to UNC pressure does not solve the problem as other tribes and meetei in those new districts will rise against it. Even in the Kangpokpi (SADAR Hills) district, cancelling the order may stop UNC blockade but Kukis who have been demanding the district for three decades will get the baton from UNC to continue the blockade in their own ways. THE DIGNIFIED WAY TO GET THE ORDERS REVOKED? In these circumstances, UNC demand for revocation of the district creation orders is untenable for negotiation. The only way UNC can bring the state government on its knees is by winning a legal battle. There is no wisdom in remaining at loggerheads with no meeting points to respect at negotiation table. Both state government and the UNC should be challenging each other at an appropriate court and accept what the court decides. In the recent tripartite talk in Delhi on February 3, 2017, the GOM representatives used the Election Model Code of Conduct as an excuse for the government’s inability to change the district creation order. This was dishonest and spineless on the part of the government. This gave a signal that it is technically possible for the government to revoke the orders if not for the Election Code of Conduct (which was not the intention as I assume). This excuse will now be used by UNC in its turn as a trump card in future negotiations after election in the same way they referred repeatedly to the four MOUs state government allegedly signed earlier about avoiding district creation without their consent. It is pertinent to mention that the same government signed another five MOUs with the Kukis in favour of their demand for a new district. A good government will never sign conflicting MOUs with different parties and roll back its own orders at the drop of a hat. Unfortunately for various reasons, the UNC highway blockade is gaining communal hues day by day particularly concerning the Meetei in the valley. UNC often clarifies the blockade is against the government which they often call majority Meetei government. The Blockade affects the Meetei the most as the highway happens to be the lifeline for the valley where they live. Again, Meetei are the community that confronts the Naga every time the territorial integrity of Manipur is at stake due to the NSCN-IM demands for Nagalim. 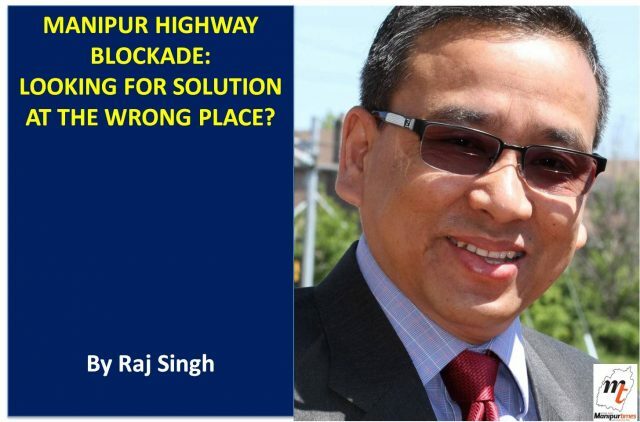 All these factors combined present the highway blockade aimed at harassing the Meetei especially when appeals for call off go unheeded. This breeds hatred among communities threatening ethnic harmony in the state. Fighting the government at the court provides the UNC an excellent opportunity to prove its prudence in avoiding collateral damage in pursuit of their goal. The state government in all its eagerness to find a solution is in soup now as rolling back its own orders at the instance of a CSO like the UNC before adjudication of its arguments by legal authorities will prove a dangerous precedence for good governance in future. 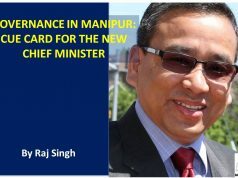 UNC should not put the state government in this situation as a responsible CSO. 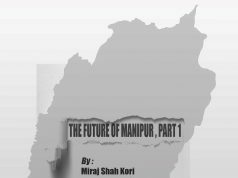 Manipur is a miniature India with great ethnic diversity to share a common habitat and destiny. Various alienating forces threaten the harmonious living of the various ethnic groups in the state. Identifying these forces and collective fighting against divisive forces will demand a great amount of compassion. 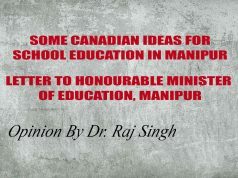 The concerns of the minorities in their living with the majority Meeteis should be addressed with extraordinary emphasis by responsible governments at every level. It might even involve some actions of social reform. In protracted fights the fighters get tired and at last they desperately wait for an arbiter to stop their fight on a term dictated by the arbiter that brings no score to either side. Such a fight is foolish. We have a tendency of throwing ultimatums at the local government and hastily looking at Delhi for intervention without looking for an opportunity to resolve the issue ourselves. This speaks of our own weakness and lack of integrity. 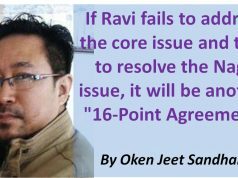 If the stalemate continues, there will be a stage when both state government and the UNC will be too willing to accept anything the central government gives them. Their fight will end without a true solution of the problem they have between them. The unsolved problem will resurface anytime in future in any form to continue nagging us more. In the present fight, both sides should look for winning or losing in dignity only through a legal remedy. 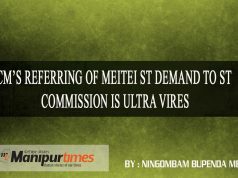 His neither yaha ka nor waha ka type of writing is the main reasons we Meitei are never respected by other communities and by the central govt. For once, take a side and speak out. Otherwise, this kind of writing is nothing but taking opportunity out of a crisis for one’s own fame. Leela pumnamak election gi lang ni haiba khangnarakle government amana control touba ngamdraba issue di pithokkhro keino UNC gi khongpi chuptoi saruk. Stop talking for negotiation with UNC, eliminate NSCN (IM) first from the land of Manipur after that UNC also automatically desolve from Manipur, India. This is only way to permanent solution. Better not to talk to UNC….We are still ok not much affected…let them call economic blockade..till they Die..let s find out new solution……we will live bt not talk to UNC at any cost….